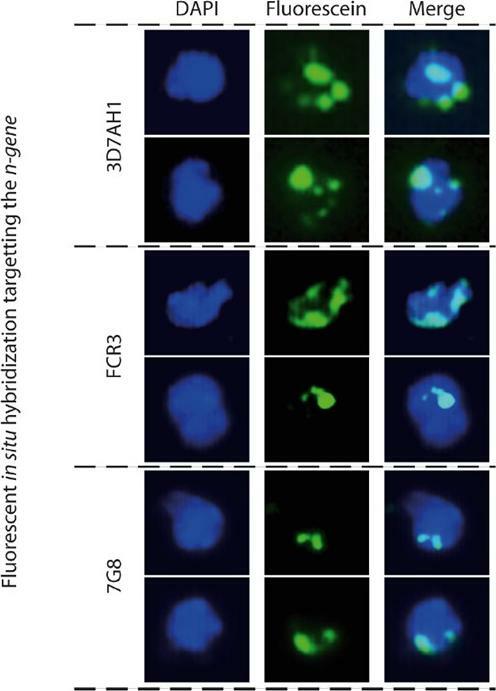 Visualization of copy numbers and localization of n-gene (green) in 3D7, FCR3 and 7G8. Distribution of fluorescent signals at the rim of the parasite nuclei (blue) confirms the position of the SD at the chromosomal ends.Mok BW, Ribacke U, Sherwood E, Wahlgren M. A highly conserved segmental duplication in the subtelomeres of Plasmodium falciparum chromosomes varies in copy number. Malar J. 2008 7:46.